It’s a big day for the Axonify R&D (research and development) team, as we celebrate the release of our 100th version. Although I can’t take any credit for the first 75 versions, I can say — I’m extremely proud of the team who has created not only a world-class product, but an entire approach to employee learning and training that’s transforming organizations worldwide. Six years ago, Axonify was born out of a need to solve a business problem. Axonify’s first customer, a large auto-parts retailer, grew tired of the ineffective results it was seeing with the traditional one-and-done training methods. The company needed to drastically reduce costs related to loss and safety incidents, by changing employee behavior and ingraining the right knowledge and safety best practices. It needed a continuous learning experience to truly impact employee behavior. And so, a basic version of a gamified question-based learning application was created by Axonify (called 17 Muscles at the time) as a better way to effect behavior change across a broad employee base. The original Axonify application allowed employees to play a simple game followed by a series of unrelated learning questions. If they participated frequently, they were allowed to claim a small reward. That year, the company recognized a $40 million reduction in loss and safety —and Axonify was off to the races. Six years later, that auto-parts retailer is still a customer. However, the product has grown from a very basic set of tools and capabilities to a robust and comprehensive microlearning platform. When the Axonify team started to realize the potential of the product, they rebuilt it — from scratch. The platform was architected to support growth and user volumes well beyond even today’s footprint of 176 countries and support for 38 languages out-of-the-box. Many of the advancements made over the years have focused on making sure the learner’s experience is as simple, streamlined, fun, and valuable as possible. Our first customer had upwards of 90% voluntary participation in the platform. 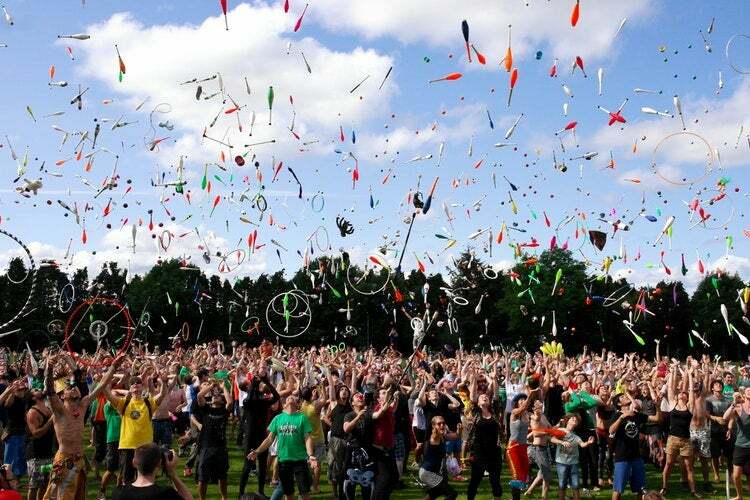 Today, Axonify’s entire customer base sustains greater than 80% voluntary participation, 2-3 times per week. This is because the Axonify team has stayed true to our belief that learning only happens when learners voluntarily consume it. Between version 1 and version 100, the Axonify team has released 40 new games, leaderboards for every area of the organization, support for rewards strategies, individual and team challenges, messaging capabilities, badging, and much more. Interestingly enough, the game “Colorfill” was released in Version 11, and to this day it’s still Axonify’s most popular game. Axonify’s product evolution has gone beyond the code to also focus on the devices it supports. Because Axonify uses responsive web design, it can literally be deployed anywhere. Today, it’s found in time clocks, point of sale systems, tablets, mobile phones, desktops, laptops, and even scales (yes, that’s right, deli scales have come a long way). But, responsive design isn’t where we stop. 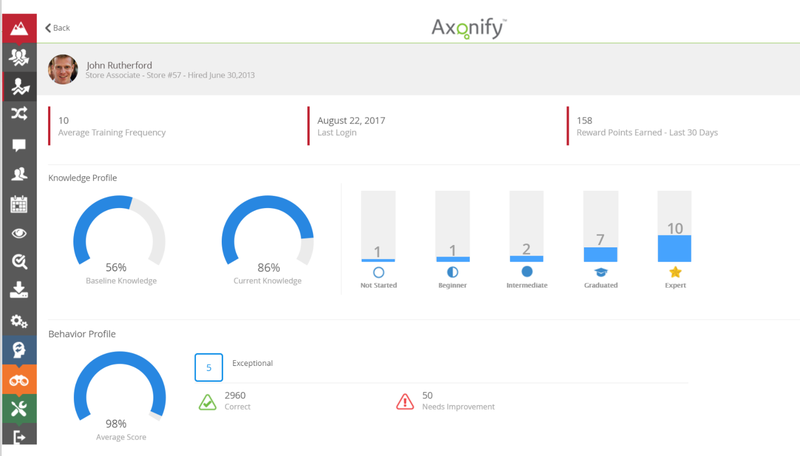 Axonify is designed with a mobile-first approach with short, focused training that gets people in and out — in just minutes. In the beginning, Axonify was exclusively a question-based microlearning engine. Of course, we still maintain that our adaptive algorithm is (hands down) the most efficient way to learn. However, we also recognize that other learning modalities have their place. As such, the product has grown to embrace certifications (for compliance), events (physical and virtual instructor-led training), exams, surveys and even a knowledge-on-demand capability that enables employees to access the information they need within seconds. Our application of brain science principles has evolved based on what we’ve learned and what our research partners have found. For example, in version 15, we introduced confidence-based assessments, which help us understand the tie between knowledge, confidence, and behavior. Similarly, our adaptive algorithm is actually on its third version, and each iteration has shortened the time to capability for our learners. Our adaptive microlearning engine is powered by brain science research and memory strengthening techniques. This innovation continues to set the industry benchmark for the market. One of the benefits of question-based microlearning in general, and a key focus for Axonify’s product development team, has been the creation of very advanced analytics. Because Axonify records every learning interaction, the knowledge they have, and ultimately how they behave, we’ve been able to continually create groundbreaking metrics for learning and business leaders alike. In version 25, Axonify released LeaderZone, which offered analytics for field leaders. This enabled leaders to understand exactly what their people knew, and more importantly, what they didn’t know. In version 50, Axonify released its groundbreaking Behaviors capability, allowing leaders to understand if employees were applying their knowledge on the job. Then, we took behaviors a bit further by introducing automatic training for when the system recognized a specific behavioral gap against set targets. And, in the near future, Axonify will be debuting its Impacts capability. Finally, leaders will be able to understand what’s working, what’s not, and how to fix it. We’ve got six years of solid learning under our belts, so what will we turn our attention to next? Honestly, you can count on it being more of the same: a high-quality, robust, sustainable product focused on helping customers solve their largest business problems. We have some exciting new products on the horizon, including both large groundbreaking features like Impacts and smaller ones like advancing video capabilities and taking our communications platform to the next level. Reflecting on the past 100 versions serves as a great reminder that there is no business problem too big that it can’t be solved in 100 releases. And, we couldn’t have made this journey to 100 without our devoted customers, partners, and community of analysts supporting us along the way — on behalf of Axonify, we thank you for joining us on this journey to transform corporate training. Andrea only works for innovative companies, so she fits right in here at Axonify. She provides the vision behind all of the components that make our robust microlearning solution and with 18+ years of experience in the tech game, she’s truly a force to be reckoned with.